Asphalt is a black, shiny, and highly-viscous petroleum product. Asphalt Poisoning is the accidental or intentional intake of products containing asphalt. Asphalt has a wide variety of uses including in laying roads and pavements, for construction (waterproofing, roofing products), pipe coatings, ink production, etc. What are the Causes of Asphalt Poisoning? What are the Signs and Symptoms of Asphalt Poisoning? How is First Aid administered for Asphalt Poisoning? Who should administer First Aid for Asphalt Poisoning? First aid for Asphalt Poisoning is administered by healthcare professionals. What is the Prognosis of Asphalt Poisoning? How can Asphalt Poisoning be Prevented? Novotny-Baumann, M., Baud, F. J., & Descatha, A. (2011). 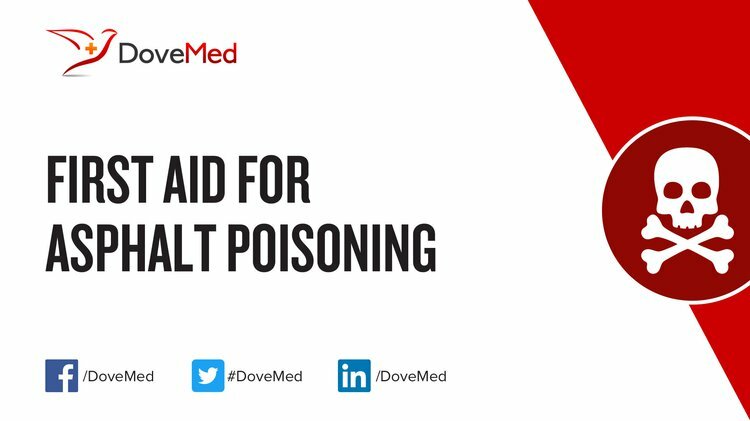 Can the initial clinical signs be used for triage of patients with acute H2S poisoning?. Journal of Emergency Medicine, 41(4), 403-404. Atasoy, N., & Kanat, Y. (2011). Determination of the amount of certain heavy metal ions and some specific liver enzymes and levels of testosterone hormone in the blood sera of heavy asphalt workers and rural community in Van, Turkey. Research Journal of Medical Sciences, 5(2), 73-79. Roegner, A., Giannitti, F., Woods, L. W., Mete, A., & Puschner, B. (2013). Public health implications of lead poisoning in backyard chickens and cattle: four cases. Veterinary Medicine: Research and Reports, 4, 11-20. Lu, Y., & Wang, L. (2010, April). Molecular dynamics simulation to characterize asphalt–aggregate interfaces. In Characterization and Behavior of Interfaces: Proceedings of Research Symposium on Characterization and Behavior of Interfaces, 21 September 2008, Atlanta, Georgia, USA (p. 125). IOS Press. Kriech, A. J., & Osborn, L. V. (2014). Review and implications of IARC monograph 103 outcomes for the asphalt pavement industry. Road Materials and Pavement Design, 15(2), 406-419. Ambursa, M. M., Faruk, U. Z., Uba, A., Sahabi, D. M., Atiku, F. A., & Koko, R. A. (2011). Comparison of adsorption Efficiency of Asphalt derived Activated carbon and commercial activated carbon for removal of Zn 2 Cr 6 and Pb 2 from waste water. Archives of Applied Science Research, 3(6), 497-505. Nciri, N., Song, S., Kim, N., & Cho, N. (2013). Physicochemical Characterization of Asphalt Ridge Froth Bitumen and Petroleum Pitch. International Journal o f Chemical, Environmental & Biological Sciences, 1, 749-756. Hu, C., Ma, J., Jiang, H., Chen, Z., & Zhao, J. (2016). Evaluation of Nano-TiO 2 Modified Waterborne Epoxy Resin as Fog Seal and Exhaust Degradation Material in Asphalt Pavement. Journal of Testing and Evaluation, 45(1), 260-267.